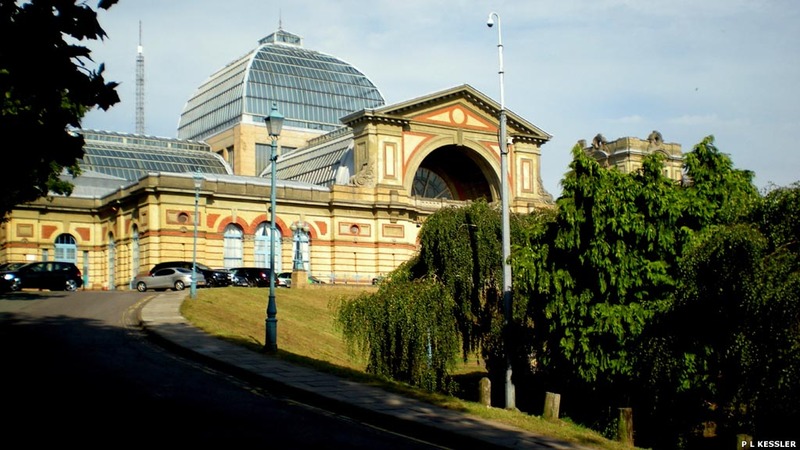 Alexandra Palace opened as a North London rival to Crystal Palace. The Edgware, Highgate & London Railway (EH&LR) was already building a line between Finsbury Park and Edgware via Highgate and East Finchley (opened in 1867), and soon added a branch line to head up to the palace. This opened on 24 May 1873 after slow construction across the steep gradients of the 'Northern Heights', and by now the Great Northern Railway had taken over the company. Services rarely made a profit, with frequent closures of the palace itself hardly helping matters. A London Underground 'New Works Programme' conversion of the route to make it part of the Northern line was terminally interrupted by the war, despite much of the work being completed prior to the beginning of the London Blitz in 1940. Inheriting the line from the LNER, British Railways finally withdrew its passenger service on 3 July 1954. The branch from Highgate to the palace was lifted in 1955, while the section from Highgate to Finsbury Park was removed in 1971 after serving as a goods-only line. The Highgate (High Level) to Mill Hill section of the line is still in use as part of the Northern line (apart from the Highgate station area itself), while the abandoned section between Mill Hill and Edgware is covered in 'Mill Hill East to Edgware' (see related links, below, right). One photo on this page copyright © Kevin Lane, and nineteen photos copyright © Philip Lindhurst, reproduced with permission. If you would like to submit your own photos of disused railway lines, contact us. Return to the Railway Walks index. Images and text copyright © P L Kessler except where stated. An original feature for the History Files.